The rundown: There are nineteen films officially eligible in this category. They include the three Golden Globe nominees: Frozen, the surest thing in this race, The Croods, and Despicable Me 2. Both could feasibly get in, though I think the latter may actually have the edge as a crowd pleaser. Monsters University was unexpectedly snubbed and may be able to slide in here. Two foreign films, The Wind Rises and Ernest and Celestine, may be able to follow in the footsteps of “A Cat in Paris” and “Chico and Rita” to be nominated. 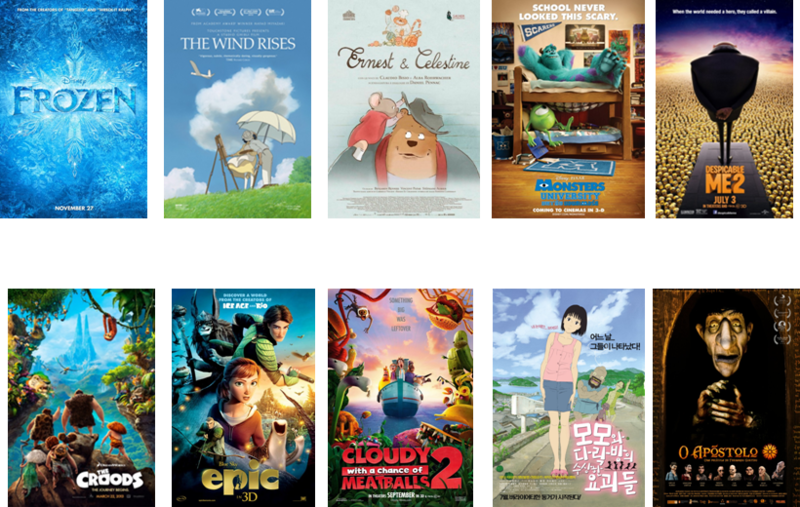 The chances for Epic and Cloudy with a Chance of Meatballs 2 are less likely, but they would be easy choices if Oscar voters don’t want to look beyond their native country. There are other possibilities, such as A Letter to Momo or O Apostolo, but I don’t see that happening. One possible crazy scenario: A bunch of sequels get in, including Cloudy with a Chance of Meatballs 2, Despicable Me 2, and Planes. Forecasted winner: It better be Frozen.